This easy, healthy appetizer will shock you with how quickly it comes together. Make sure to use the freshest tuna available (I happened upon a great sale at my grocery store, but you may have to pay a few dollars more for the good stuff), and a ripe-but-not-too-soft avocado for the right consistency. Combine all ingredients except cucumber in a mixing bowl until well-incorporated. Spoon mixture into a short drinking glass or cylinder mold. Press down gently to pack. 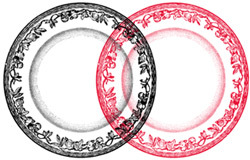 Place, open end down, in the center of a plate and gently slide up to remove glass or mold, leaving a tower. 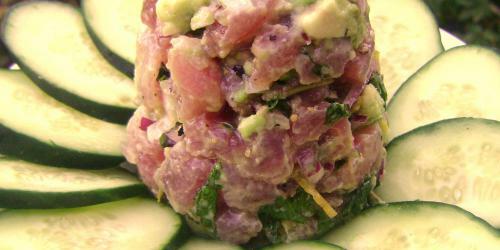 Arrange cucumber slices around the tower and use to scoop up the tartare. Nice. I’d use lime instead of lemon, but that might just be me. This looks and sounds wonderful, But I’m always hesitant to buy tuna and serve it raw. I make an awesome seared tuna every now and then, but raw scares me a bit. 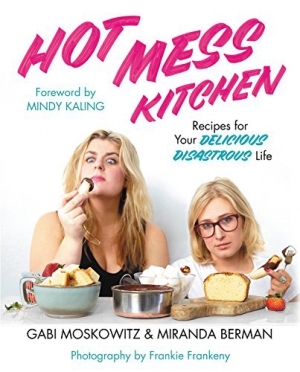 Hey Gabi….if I’m making this for a dinner party tonight, how far in advance can I prepare it? Or should I just bring the ingredients & prepare when I get there? For my cookbook I think this will be a great recipe. But I will ofcourse make some adjustments in it and will not copy it as it is. I would like more useful reference from you guys as you upload the best recipes in the internet.